59 Mile House, Freight Team. Freighting Team Leaving Ashcroft. Second From Right Is "Soapy" Smith, Of Whom It Was Said That He Would "Sooner Fight Than Eat". James A. Teit and Harlan I. Smith's pack train at Spences Bridge. Landing Freight At Cook's Ferry On The Thompson River Near Spences Bridge. 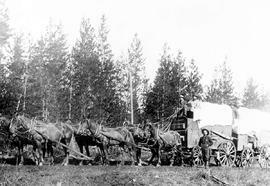 The 59 Mile House, Cariboo Road, Showing William Parker's Team; George Wadsworth Driving. 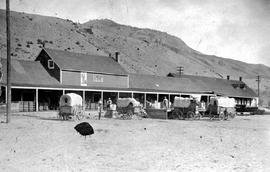 The Ashcroft Hotel; outside, the last bull teams on the Cariboo Road. The last pack train leaving Ashcroft for Hazelton.